This paper demonstrates the effective use of a fiber dissection method to reveal the superficial white matter tracts and periventricular structures of the human brain, in three-dimensional space, to aid student comprehension of ventricular morphology. Colibaba, A. S., Calma, A. D., Webb, A. L., Valter, K. Exploring Deep Space - Uncovering the Anatomy of Periventricular Structures to Reveal the Lateral Ventricles of the Human Brain. J. Vis. Exp. (128), e56246, doi:10.3791/56246 (2017). Anatomy students are typically provided with two-dimensional (2D) sections and images when studying cerebral ventricular anatomy and students find this challenging. Because the ventricles are negative spaces located deep within the brain, the only way to understand their anatomy is by appreciating their boundaries formed by related structures. Looking at a 2D representation of these spaces, in any of the cardinal planes, will not enable visualisation of all of the structures that form the boundaries of the ventricles. Thus, using 2D sections alone requires students to compute their own mental image of the 3D ventricular spaces. The aim of this study was to develop a reproducible method for dissecting the human brain to create an educational resource to enhance student understanding of the intricate relationships between the ventricles and periventricular structures. To achieve this, we created a video resource that features a step-by-step guide using a fiber dissection method to reveal the lateral and third ventricles together with the closely related limbic system and basal ganglia structures. One of the advantages of this method is that it enables delineation of the white matter tracts that are difficult to distinguish using other dissection techniques. This video is accompanied by a written protocol that provides a systematic description of the process to aid in the reproduction of the brain dissection. This package offers a valuable anatomy teaching resource for educators and students alike. 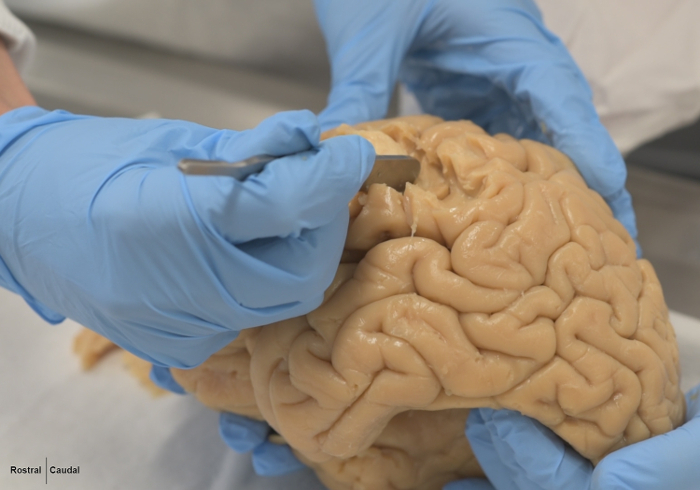 By following these instructions educators can create teaching resources and students can be guided to produce their own brain dissection as a hands-on practical activity. We recommend that this video guide be incorporated into neuroanatomy teaching to enhance student understanding of the morphology and clinical relevance of the ventricles. Many students struggle to comprehend the negative spaces of the ventricular system, located deep within the human brain1,2. Commonly used resources available for students to study the ventricles provide relatively crude representations of the intricate 3D relationships of these deep cerebral structures. Understanding the 3D anatomy of the ventricular system and related structures is particularly important in neurosurgery because access to the ventricular system is one of the most utilised techniques to measure intracranial pressure, decompress the ventricular system, and administer medications3. In addition, rapid advancements in medical imaging have necessitated the development of skills in the interpretation of 3D anatomy. Two-dimensional (2D) sections of the brain in different planes are typically used to visualise the deep brain structures that form the boundaries of the negative ventricular spaces4. However, 2D slices of the brain alone are insufficient to enable students to understand the full extent of the 3D architecture of the ventricles and the fine details of the region such as fiber bundles connecting the cortex and subcortical structures5. Consequently, educators have to rely on the students' own ability to compute a comprehensible 3D conception of the ventricles4. Students who struggle with spatial awareness find it extremely difficult to create this 3D image. Whilst plastic models and ventricular casts provide a 3D representation of the ventricular system, they fail to demonstrate the comprehensive relationships that form the boundaries of the ventricles. Students often mindlessly remove parts of the plastic model to access the ventricular system and understand its interconnections. In this process, they frequently overlook the detailed relative positions of each structure and lose understanding of their relationships (e.g. formation of the roof of the lateral ventricles by the corpus callosum). The development of new computerised teaching tools has addressed some of these limitations. However, many of these models are limited to static text and images and do not take advantage of the interactivity offered by these new technologies7,8. Whilst interactive technologies enable the user to rotate 3D computer models to study multiple viewpoints, this can confuse some users especially novices who find it challenging to orientate structures6. Furthermore, interactive computer resources have been shown to be less effective in teaching more complex anatomical structures6. Thus, one of the challenges in neuroanatomy education is to provide students with resources that enable them to adequately visualize the ventricles and appreciate their 3D structure and anatomical relationships including the delicate associative, projection, and commissural fiber bundles that form complex relationships with the periventricular structures2. Dissection has been shown to be an excellent educational method for learning anatomy7,8. A recent study provides evidence of the benefits of student dissection in learning neuroanatomy. In 2016, Rae et al. found improved short-term and long-term retention of neuroanatomy knowledge in students participating in dissections9. Whilst advances in technology continue to improve the accuracy and interactivity of 3D computer models, the knowledge acquired through hands-on dissection cannot be replicated digitally at the present time10. In this study, we aimed to produce a reproducible dissection of a human brain. We chose a fiber dissection method because that allows preservation of the delicate fiber bundles and periventricular gray matter structures to better define the negative space of the ventricles. Here we present a comprehensive step-by-step guide for creating a prosection model of the ventricles and periventricular structures together with an accompanying training video for use in neuroanatomy teaching and learning. These resources can be used for teaching and learning the neuroanatomy of the brain by both educators and students. All methods described here have been approved by the Human Research Ethics Committee of the Australian National University. To create the ventricular model we used the Klingler fiber dissection technique12,14. The Klingler technique is a tactile dissection method that involves removing small portions of the gray matter of the cortex and peeling off bundles of nerve fibers, thus providing a step-by-step guide through the tissue layers from the surface to the deep structures of the brain. NOTE: The brain specimen used to demonstrate this protocol in the accompanying video and images was carefully removed from a formalin-embalmed human cadaver obtained from the body donor program of the Medical School, Australian National University. The donor had no known history of neuropathological disease. After removal of the dura mater, the brain was stored in 10% ethanol solution at room temperature for three years. Obtain a whole brain from an embalmed human cadaver and remove the dura mater and store the brain in 10% ethanol at room temperature prior to dissection. Caution: Use personal protection equipment in a well-ventilated room in accordance to local guidelines when handling. Ensure all participants are familiar with the institutional procedures for the safe handling and disposal of a scalpel and sharp objects before commencing the dissection protocol. Prepare the following instruments: scissors, forceps, scalpel blades (No. 15 and No. 22), metal probe, and the blunt end of a metal scalpel handle (Figure 1). Use the blunt end of the scalpel handle to minimise damage to the delicate nerve fibers and conserve the major white matter fiber tracts (Figure 2)13. Position the brain so that its ventral surface is facing upwards. Remove the arachnoid mater and associated vasculature from both cerebral hemispheres using a pair of atraumatic (blunt) forceps. Gently lift the cerebellum and locate the inferior colliculi. Place the scalpel blade (No. 15) attached to a long scalpel handle just caudal to the inferior colliculi and cut axially through the brainstem. Keep the blade as close to horizontal as possible to avoid damaging the cerebellum. Take care to preserve the tectum of the midbrain. Position the brain to view the left or right lateral fissure. Starting at the supramarginal gyrus, use the blunt end of the scalpel handle to gently remove the superficial cortical layers. Gently move forward first above, then below the lateral sulcus to reveal the horizontal association fiber bundles running in the parietal, frontal, and temporal lobes, respectively. Follow the direction of the fibers arching around the posterior border of the insula connecting the superior and inferior longitudinal fasciculi to reveal the arcuate fasciculus. Identify the short gyri of the insular cortex and then remove the insula. Next remove the extreme capsule and claustrum to reveal the underlying external capsule. Note the bulge formed by the lentiform nucleus deep to the capsule. Moving towards the dorsal surface of the cortex, reveal the fibers of the corona radiata (Figure 4). Remove the remaining cortex and underlying white matter on the dorsal surface of the brain to reach the cingulate gyrus. Continue to use the blunt-end of the scalpel handle to remove the cingulate cortex to reveal the cingulum, the white matter tracts connecting the anterior perforated substance with the parahippocampal gyrus. Use the same technique to remove the cingulum from posterior to anterior to reveal the corpus callosum, composed of commissural fibers connecting the two cerebral hemispheres. The dorsum of the body (trunk) of the corpus callosum will now be visible (Figure 6). Repeat steps 2.3 to 2.8 on the contralateral cerebral hemisphere. Palpate and identify the extent of the lateral ventricle on one of the hemispheres. Using a probe, puncture the lateral wall of the ventricle at the site of the collateral trigone. Using a size 24 blade (attached to a No. 4 scalpel handle) enter through the puncture-site and cut inferiorly to open up the entire length of the inferior horn of the lateral ventricle. Now return to the ventricular collateral trigone to extend the cut superiorly towards the splenium of the corpus callosum (dotted line in Figure 5). Repeat steps 2.10 and 2.11 on the other hemisphere. Open the body of the lateral ventricle by continuing the incision from the trigone rostrally using a cut approximately 3 cm parallel to the corpus callosum in both hemispheres (dotted lines in Figure 6). Join the two parallel incisions in each hemisphere rostrally at the level of the genu and caudally at the level of the splenium of the corpus callosum. Using forceps, held in the non-dominant hand, gently lift the corpus callosum at the splenium. With a small sharp pair of scissors, held in the dominant hand, separate the splenium from the underlying septum pellucidum. Once you have reached the rostral end of the body, cut the corpus callosum and remove it. Nestle the ventral surface of the brain lengthwise on the palm of your non-dominant hand to stabilize the occipital and temporal areas (posterior part). At the same time, use your dominant hand to firmly but gently hold the anterior end of the brain by placing your opposed fingers and thumb on the lentiform nuclei of both sides of the brain. Using gentle pulling and twisting motions, physically separate the anterior and posterior parts of the brain taking special care to keep the choroid plexus intact. 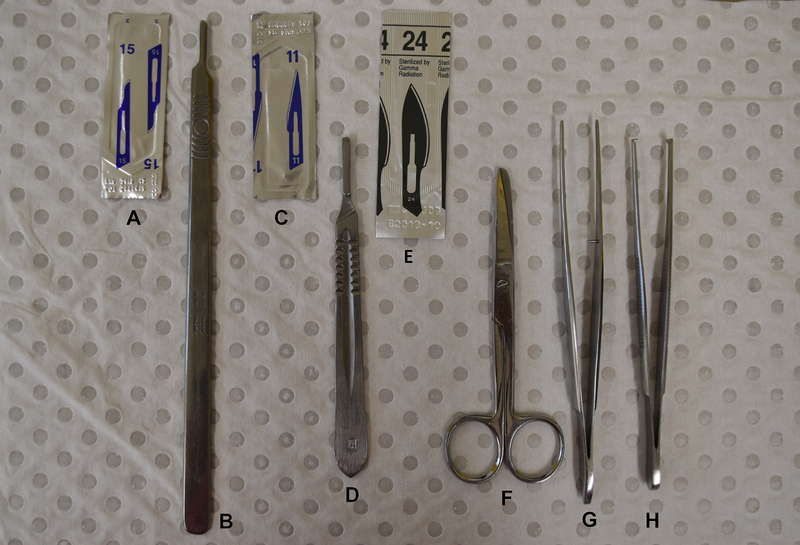 It is recommended that a colleague be present to guide the separation and gently section any remaining connecting tissues during the process using a scalpel. This method of dissection exposes the ventricular system by separating the brain into an anterior and a posterior part (Figure 7 and Figure 8). The posterior part offers an internal view to the collateral trigone from which the posterior and inferior horns can be seen extending to the occipital and temporal lobes, respectively (Figure 8). In the inferior/temporal horn the hippocampus, which forms its medial wall, is clearly visible as are the fimbriae and the crura of the fornix. The anterior part of the prosected brain (Figure 7) enables observation of the structures that form the boundaries of the body and the rostrally projecting anterior horns of the lateral ventricle. Rostrally, the large heads of the caudate nuclei are clearly shown to form the lateral border of the anterior horn. The medial wall and the roof of the lateral ventricles have been largely removed but at the rostral end, in this specimen, the remainder of the septum pellucidum medially, and the corpus callosum superiorly were still visible. Moving dorsally, the large mass of the thalamus becomes visible as it forms the majority of the floor of the body of the ventricle, while the narrow body of the caudate nucleus runs dorsolateral to the thalamus forming a small part of the floor of the ventricle laterally. The choroid plexus is visible as it curves around the thalamus. When the thalami are gently separated, the third ventricle can be seen bounded laterally by the medial walls of the thalami and superiorly by the body of the fornix. The interthalamic adhesion is prominently seen in the midline (Figure 7). Bordering the third ventricle anteriorly, the columns of the fornix are also visible. In addition, we can visualize the epithalamic structures of the pineal gland and the habenula postero-superior to the thalamus. Ventrally, the midbrain structures such as the superior and inferior colliculi on the tectum and the cerebral aqueduct can be readily identified. 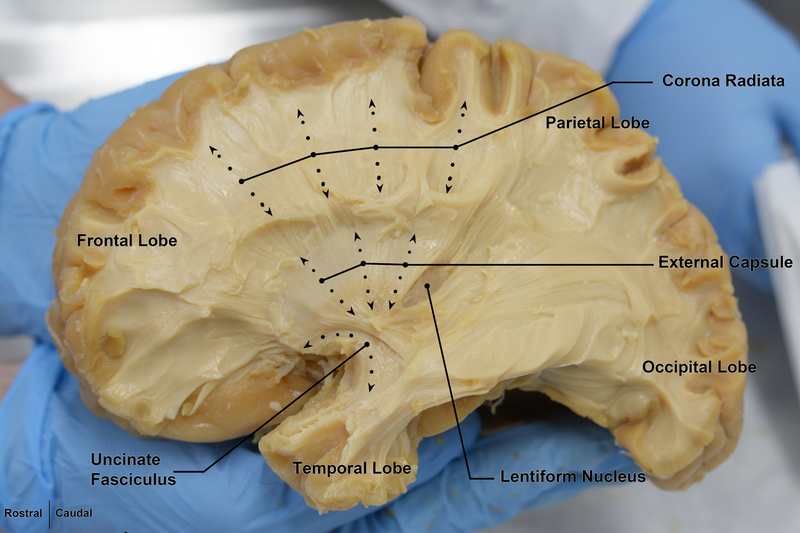 Upon commencing the fiber dissection of the specimen used in this video, several tan-colored white-centered lesions were discovered in the deeper white matter tracts such as the corona radiata (Figure 5). Histological examination of samples of the lesions suggested that they were the result of metastasis from a non-small cell lung carcinoma. There was no known history of neuropathological disease in the specimen prior to dissection and as such these lesions are an incidental finding. Figure 1: Instruments used for performing the brain dissection. (A) blade 15; (B) long scalpel handle; (C) blade 11; (D) short scalpel handle; (E) blade 24; (F) scissors; (G) atraumatic forceps; (H) toothed forceps Please click here to view a larger version of this figure. Figure 2: How to hold the metal scalpel handle and use its blunt end to remove the superficial cortical layers to reveal the underlying white matter fiber bundles. Please click here to view a larger version of this figure. Figure 3: Lateral view of the left side of the brain. 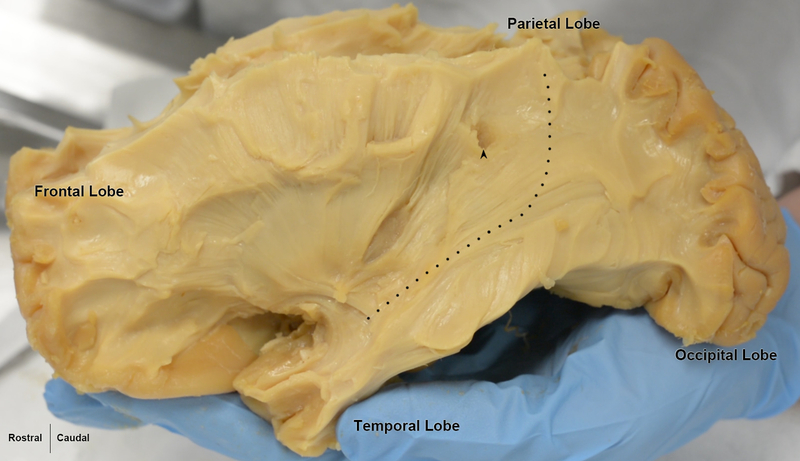 Removal of the superficial grey and white matter of the frontal, parietal, occipital, and part of the temporal lobes revealed the superior and inferior longitudinal fasciculi, the white fiber connection of the lobes, and the insular cortex. Please click here to view a larger version of this figure. Figure 4: Lateral view of the left side of the brain. 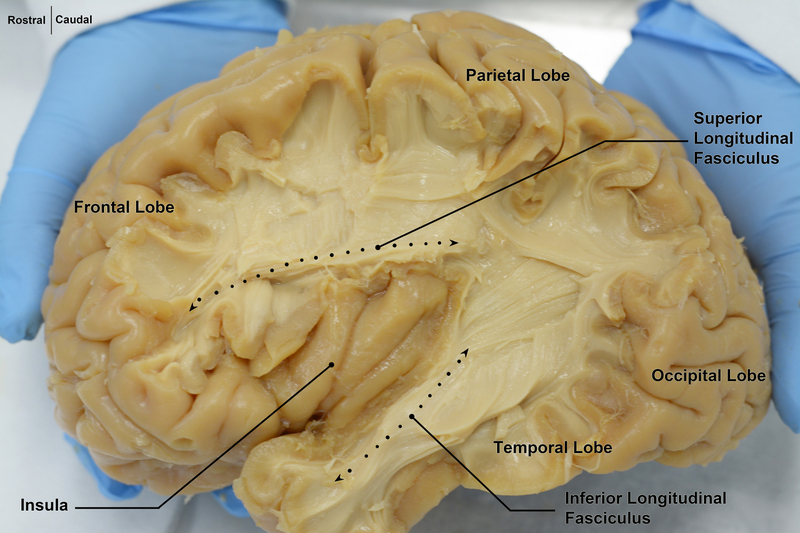 Deeper dissection of the grey and white matter of the frontal, parietal, occipital, and part of the temporal lobes revealed the vertically oriented fibers of the corona radiata and external capsule as well as the uncinate fasciculus. A window cut into the fibers of the external capsule reveals the grey matter of the lentiform nucleus. Please click here to view a larger version of this figure. 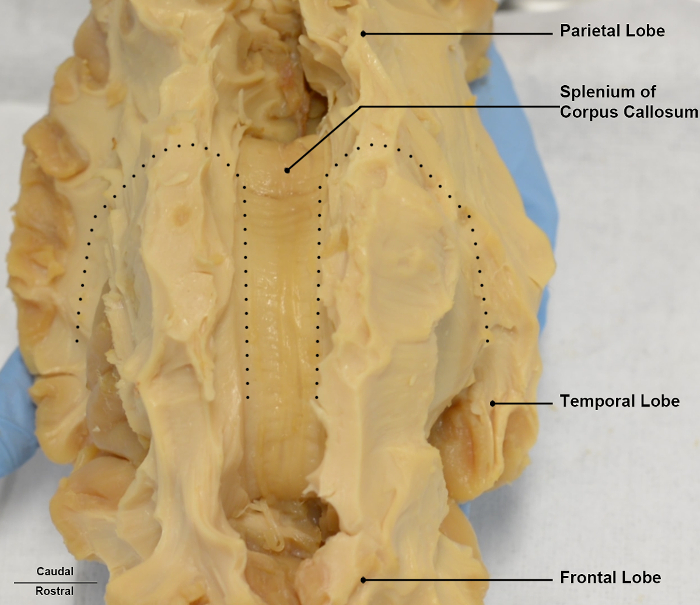 Figure 5: Lateral view of the left side of the brain with the cortex of the cingulate gyrus removed. The dotted line indicates the position of the cuts to open the lateral ventricle. The small arrowhead indicates the location of the small pathological lesion which was found incidentally during the dissection. Please click here to view a larger version of this figure. Figure 6: Superior view of the brain with both cingulate gyri removed, exposing the corpus callosum in the midline. The dotted lines show the positions of the parallel cuts to be performed along the corpus callosum to open the roof of the lateral ventricles. Please click here to view a larger version of this figure. Figure 7: Caudal view of the anterior half of the brain showing the anterior horn and body of the lateral ventricles, the third ventricles, and the structures surrounding them. Please click here to view a larger version of this figure. Figure 8: Rostral view of the posterior half of the brain showing the posterior horns and inferior horns of the lateral ventricles as well as the hippocampus and its projection into the fornix. Please click here to view a larger version of this figure. 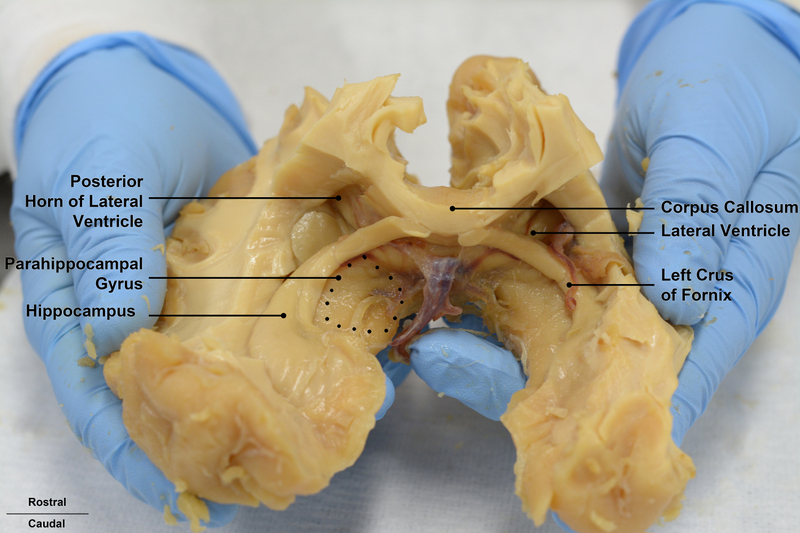 The purpose of this paper was to devise a dissection guide for dissemination to teachers and students that could be used to enhance teaching and learning of the deep ventricular and periventricular structures of the human brain. We have devised a step-by-step guide with accompanying images, together with a video resource, that can be used to aid understanding of the morphology of the ventricles and their associated structures. The dissection technique itself is not new. Fiber dissection has been previously used for the study of cerebellar anatomy14. However, the novelty of our study was the combination of a traditional dissection method together with modern annotated video production. This demonstrates how dissection, despite its reduced use in anatomy education, can be judiciously used to aid student learning, especially for students who may not have access to human dissection or prefer using electronic resources for their learning. The fiber dissection technique provides a complementary resource to plastic and computer models for learning the 3D anatomy of the cerebral ventricles. 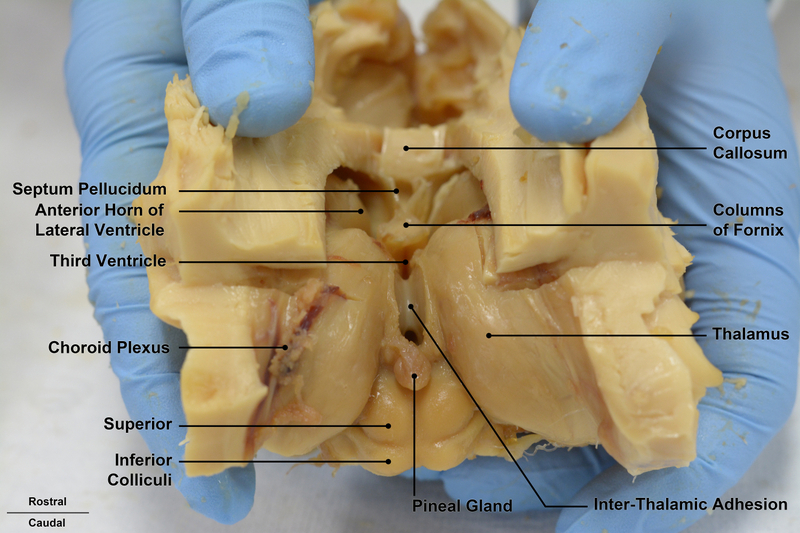 Compared to plastic models, brain cross-sections, and ventricular casts, our dissection method demonstrated the 3D structure of the ventricles and their relationships with the structures that form the boundaries of the cerebral ventricles. Providing effective resources for learning the deep structures of the human brain is one of the challenges for anatomy educators. The resources typically used have some limitations. Although dissection has traditionally been the cornerstone of anatomy education, its availability has significantly decreased due to competing time pressures from other disciplines, safety concerns, and a reduced number of donors7. However, dissection is beneficial not only because it allows appreciation of the 3D organisation of the brain, but it also provides the benefit of haptic perception (tactile gnosis)15. There is a need for alternative methods of delivering the dissection experience, as not all institutions have access to human brains for dissection. Thus, we developed this instructional video, which can be used as a stand-alone teaching resource to demonstrate the 3D anatomy and relationships of the human brain. Furthermore, it can be used as a guide for students to perform their own dissection on human or animal brains or alternatively used by staff to devise prosected brain models that can be used for student study. Therefore, we revisited the use of dissection in visualising the intricate anatomy of this region. The Klingler dissection technique was selected to facilitate student comprehension of the 3D anatomy of the ventricles and periventricular structures. An additional benefit of the technique was that it allows conceptual understanding of the projecting, association, and commissural fiber systems. In the past, the Klingler method has been used for demonstrating cerebellar and white matter tract nuclei14,16. In this study, we demonstrate how it can be applied to the exploration and visualization of the cerebral ventricles and related structures. Many sectioning techniques of the brain use sharp cuts that destroy the delicate structures and their connections. By choosing a method that conserves the deeper structures and their connections in the brain, we have created a visual guide to demonstrate their intricate anatomy and relationships. There are some aspects of the process that could be improved. The embalming technique should be considered when selecting human brain specimens for dissection. Our cadaver was embalmed via the femoral artery and it is possible to obtain even higher quality brain tissue by embalming via the carotid arteries or with epidural infiltration of the fixative solution. Brain tissue itself is delicate and may easily get damaged during the dissection process or handling by students. Due to the fragility of the resultant brain prosection and to maximise its use, several additional steps can be incorporated. 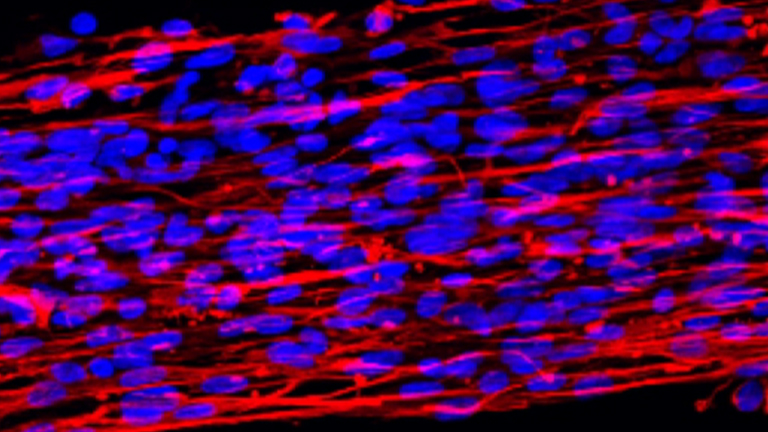 Plastination may be used to improve the durability and longevity of prosected specimens prepared using this technique17. Another alternative to enhance specimen longevity and facilitate mass production of the dissection is to create reproductions using 3D printing18. Freezing the brains prior to dissection may enhance the technique as the process of freezing and thawing allows penetration of the fibers with formalin, which separates the fibers for easier dissection19,20. However, while this freezing method aids dissection, Chowdhury and colleagues found that it did not produce consistent results16 and thus we elected not to use the freeze-thaw method in our dissection. The fiber dissection technique is an excellent way to demonstrate the structure of the ventricular system of the brain. In our own institution, informal feedback and our personal observations of students' utilisation of this resource have indicated that students found it helpful in learning the anatomy of the cerebral ventricles and related structures. The educational benefits of this resource are yet to be evaluated objectively through assessment and feedback to explore its full value and limitations. We recommend combining the video resource and/or dissection method with a range of complementary resources to provide students with optimal opportunities to appreciate the complex 3D organisation of the ventricles and surrounding structures. The authors would like to thank the donors and their families for their generous gift. Thank you to Mr. Xiao Xuan Li who recorded the video and helped with video editing; Ms. Hannah Lewis and Mr. Louis Szabo for providing technical support; and Professor Jan Provis for reviewing the video and providing input to the video content. Smith, D. M., et al. A virtual reality atlas of craniofacial anatomy. Plast Reconstr Surg. 120, (6), 1641-1646 (2007). Estevez, M. E., Lindgren, K. A., Bergethon, P. R. A novel three-dimensional tool for teaching human neuroanatomy. Anat Sci Educ. 3, (6), 309-317 (2010). Mortazavi, M. M., et al. The ventricular system of the brain: a comprehensive review of its history, anatomy, histology, embryology, and surgical considerations. Childs Nerv Syst. 30, (1), 19-35 (2014). Drapkin, Z. A., Lindgren, K. A., Lopez, M. J., Stabio, M. E. Development and assessment of a new 3D neuroanatomy teaching tool for MRI training. Anat Sci Educ. 8, (6), 502-509 (2015). Ruisoto Palomera, P., JuanesMéndez, J. A., Prats Galino, A. Enhancing neuroanatomy education using computer-based instructional material. Computers in Human Behavior. 31, (0), 446-452 (2014). Chariker, J. H., Naaz, F., Pani, J. R. Item difficulty in the evaluation of computer-based instruction: an example from neuroanatomy. Anat Sci Educ. 5, (2), 63-75 (2012). Bouwer, H. E., Valter, K., Webb, A. L. Current integration of dissection in medical education in Australia and New Zealand: Challenges and successes. Anatomical sciences education. 9, (2), 161-170 (2016). Nwachukwu, C., Lachman, N., Pawlina, W. Evaluating dissection in the gross anatomy course: Correlation between quality of laboratory dissection and students outcomes. Anatomical Sciences Education. 8, (1), 45-52 (2015). Rae, G., Cork, R. J., Karpinski, A. C., Swartz, W. J. The integration of brain dissection within the medical neuroscience laboratory enhances learning. Anatomical Sciences Education. (2016). Choi, C. Y., Han, S. R., Yee, G. T., Lee, C. H. Central core of the cerebrum. J Neurosurg. 114, (2), 463-469 (2011). Standring, S., Ellis, H., Healy, J., Williams, A. Anatomical Basis Of Clinical Practice. Grays Anatomy. 40, 40th, Churchill Livingstone, London. 415 (2008). Ojeda, J. L., Icardo, J. M. Teaching images in Neuroanatomy: Value of the Klinger method. Eur. J. Anat. 15, 136-139 (2011). Skadorwa, T., Kunicki, J., Nauman, P., Ciszek, B. Image-guided dissection of human white matter tracts as a new method of modern neuroanatomical training. Folia Morphol (Warsz). 68, (3), 135-139 (2009). Arnts, H., Kleinnijenhuis, M., Kooloos, J. G., Schepens-Franke, A. N., van Cappellen van Walsum, A. M. Combining fiber dissection, plastination, and tractography for neuroanatomical education: Revealing the cerebellar nuclei and their white matter connections. Anat Sci Educ. 7, (1), 47-55 (2014). Turney, B. W. Anatomy in a modern medical curriculum. Ann R Coll Surg Engl. 89, (2), 104-107 (2007). Chowdhury, F., Haque, M., Sarkar, M., Ara, S., Islam, M. White fiber dissection of brain; the internal capsule: a cadaveric study. Turk Neurosurg. 20, (3), 314-322 (2010). Riederer, B. M. Plastination and its importance in teaching anatomy. Critical points for long-term preservation of human tissue. J Anat. 224, (3), 309-315 (2014). McMenamin, P. G., Quayle, M. R., McHenry, C. R., Adams, J. W. The production of anatomical teaching resources using three-dimensional (3D) printing technology. Anat Sci Educ. (2014). Ture, U., Yasargil, M. G., Friedman, A. H., Al-Mefty, O. Fiber dissection technique: lateral aspect of the brain. Neurosurgery. 47, (2), 417-426 (2000). Klingler, J., Gloor, P. The connections of the amygdala and of the anterior temporal cortex in the human brain. Journal of Comparative Neurology. 115, (3), 333-369 (1960).